CONFESSION: I used to hate my skin. Okay, I think that feeling was mutual because I'm pretty sure it hated me too! All that hate and anger was manifesting as blemishes, redness, and unattractive bumps and dry spots all over my body. I was tried to make it happy by buying $100 creams and $150 spa treatments, but nothing worked! Soooooo frustrating!!!!! But then something amazing happened: I went all natural (aka chemical free), my skin cleared up and became soooooo happy! Sure, it still acts up every now and then (um, winter skin anyone?) but I've learned that sometimes my sensitive skin just needs to be pampered a bit more than other people's skin especially when it's dry. And that's 100% okay because I like being pampered. I hate to toot my own horn, but these body lotion bars are kind of amazing. 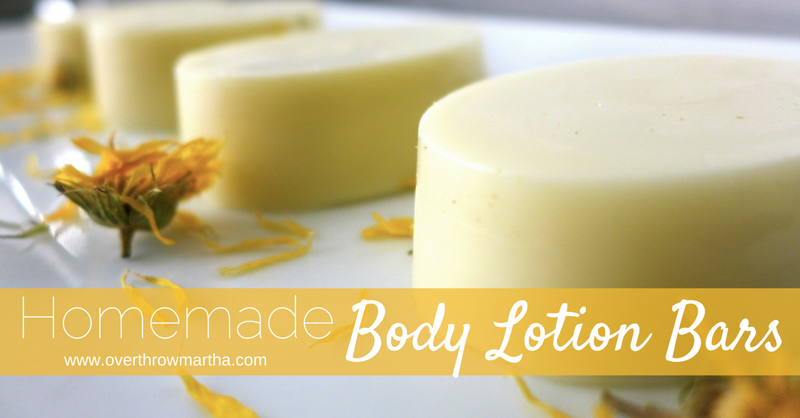 They have some awesome ingredients like calendula oil which is fantastic for sensitive or dry skin. It also has several essential oils which smell fantastic, but they actually work to help support the skin in a gentle, yet powerful way. Did I mention this SMELLS FANTASTIC?! It's definitely a unisex smell too which has been given the Official "Clint Stamp of Approval" annnnnd that's kind of a big deal. This lotion bar is very versatile too! The essential oils in this recipe work great for soothing dry, sensitive skin, but don't be afraid to add oils to amplify the soothing nature of this lotion (example: for extra dry and irritated I've added 10 drop of Myrrh, but Helichrysum would work great for this too!) In the summer, I like to add 15-20 drops of Carrot Seed essential oil for extra SPF protection. Remember, it's very important to use quality essential oils if you are looking for quality results! I recommend this brand. I melt the shea butter, beeswax and coconut oil over a double boiler. Once they were melted, I removed it from the heat and stirred in the Calendula oil, vitamin E, vegetable glycerin and essential oils. I used this silicone mold . I filled each mold about half way with liquid to make 8 half size bars using this recipe. I let them harden overnight and removed them from the mold in the morning. If you don't have calendula, you can substitute any other carrier oil for similar consistency, but you will not have the same kind of soothing effect as calendula oil has. I've adapted this recipe from my friend Kristi's version at the Veggie Converter which is also pretty stinkin' darn awesome. 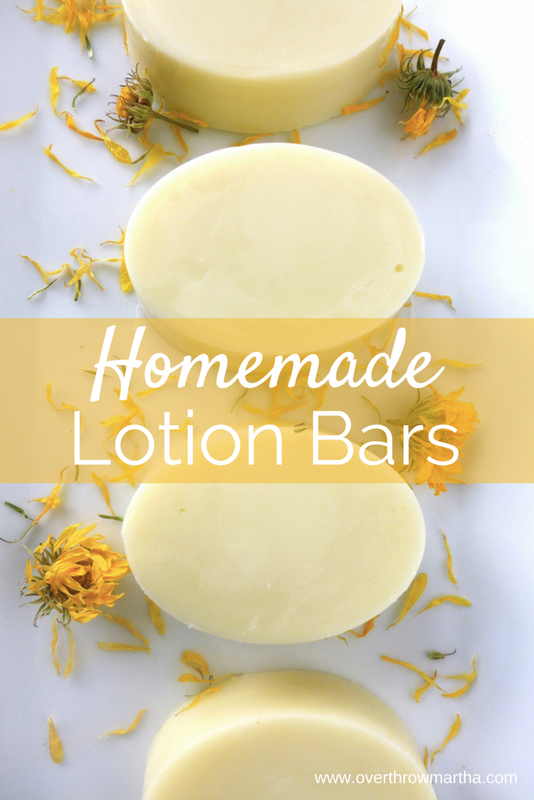 You can check out her lotion bars here: DIY Coconut Oil Lotion Bars. She uses the cutest molds!! A little goes a long way so no need to over do it, but remember-- it's not rocket science. Step 1: Rub the lotion bar with your hand. Step 2: You rub that hand on your body.... or your husband... or a random hottie. You're smart-- you get the idea!!! These DIY lotion bars are great to take on vacation or to give as gifts, but be sure to put them in a container because they can get a little messy! One of my friends makes smaller lotion bars and puts them in an empty tin mint container. Brilliant!